The medical use of cannabis is legal (with a doctor’s recommendation) in 33 states, plus the District of Columbia, and the territories of Guam, Puerto Rico, the Northern Mariana Islands, and the U.S. Virgin Islands. Fourteen other states have laws that limit THC content, for the purpose of allowing access to products that are rich in cannabidiol (CBD), a non-psychoactive component of cannabis. Although cannabis remains a Schedule I drug, the Rohrabacher–Farr amendment prohibits federal prosecution of individuals complying with state medical cannabis laws. The recreational use of cannabis is legal in 10 states (Alaska, California, Colorado, Maine, Massachusetts, Michigan, Nevada, Oregon, Vermont, and Washington), the District of Columbia, and the Northern Mariana Islands. Another 13 states plus the U.S. Virgin Islands have decriminalized. 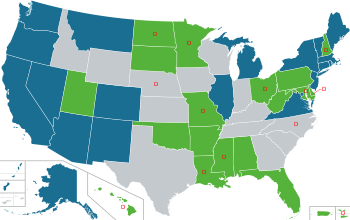 Commercial distribution of cannabis is allowed in all jurisdictions where cannabis has been legalized, except Vermont and the District of Columbia. Prior to January 2018, the Cole Memorandum provided some protection against the enforcement of federal law in states that have legalized, but it was rescinded by Attorney General Jeff Sessions. Possession under three ounces a misdemeanor; Cities of Fayetteville and Eureka Springs labeled cannabis their lowest law enforcement priority. November 8, 2016: medical marijuana legalized when Issue 6 passed by 53%. first offense, with potential mandatory drug education. Second offense fine up to $500 and up to five days’ jail, third offense up to $500 fine and maximum one week jail. November 8, 2016: recreational marijuana legalized when Question 2 passed by 54%. Home cultivation allowed if 25 miles away from store. July 23, 2013: medical marijuana legalized when Governor Maggie Hassan signed HB 573. July 11, 2015: Governor Hassan expanded medical marijuana law. July 18, 2017: Governor Chris Sununu signed bill decriminalizing up to three-quarters of an ounce. April 2007: medical marijuana legalized when Governor Bill Richardson signed Senate Bill 523. Voter approved Measure 91 November 4, 2014 provides for possession and sale of set amounts of cannabis. Cannabis sentencing reform signed July 1, 2015 by Governor Kate Brown. More medical cannabis reforms signed July 28, 2015 by Governor Brown effective October 1, 2015. Governor Brown signed 25% cannabis sales tax. 2014: Governor Nikki Haley signed Senate Bill 1035, “Julian’s Law”, allowing children with severe epilepsy to be treated with CBD oil if recommended by a physician. June 1, 2015: governor Greg Abbott signed a bill legalizing CBD oil for medical use. HB 105 signed in 2014 allows use of low-THC cannabis oil for patients with epilepsy. HB 195 signed in March 2018 allows cannabis for certain terminally ill patients. January 2018: HB511 passed,  legalizing one ounce and two plants, taking effect on July 1, 2018. First state legislature to legalize recreational marijuana. Being under the influence of marijuana is a misdemeanor up to 90 days in prison and fine up to $100. Possession three ounces or less a misdemeanor up to 1 year in prison and fine up to $1000. Residents passed a ballot measure on November 4, 2014, that allows cannabis for medical use only. (Washington state) legal Legal sales since December 2015 In September 2015, the tribe signed the nation’s first tribe-state cannabis pact, under which the tribe would operate a cannabis retail store with regulations paralleling those of Washington state. ^ a b “State Medical Marijuana Laws”. National Conference of State Legislatures. June 27, 2018. Retrieved July 3, 2018. ^ Ingraham, Christopher (June 13, 2017). “Jeff Sessions personally asked Congress to let him prosecute medical-marijuana providers”. The Washington Post. Retrieved December 31, 2017. ^ “MARIJUANA OVERVIEW”. National Conference of State Legislatures. Retrieved December 31, 2017. ^ Zapotosky, Matt; Horwitz, Sari; Achenbach, Joel (January 4, 2018). “Use of legalized marijuana threatened as Sessions rescinds Obama-era directive that eased federal enforcement”. The Washington Post. Retrieved January 4, 2018. ^ Summers, DJ (March 22, 2017). “Is CBD Oil Legal? Depends on Where You Are and Who You Ask”. Leafly. Retrieved January 3, 2018. ^ Jaeger, Kyle (September 27, 2018). “The DEA Just Placed a Marijuana-Derived Drug In Schedule V”. Marijuana Moment. Retrieved September 29, 2018. ^ Green, Johnny (November 2, 2017). “Are CBD Products Legal In All 50 States?”. Weed News. Retrieved January 3, 2018. ^ Labs, Kelley Code. “Legal Weed Alaska”. legalweedalaska.com. Retrieved January 24, 2017. ^ “Here’s how many cannabis plants Alaskans can now legally possess at home”. AlaskaDispatchNews. July 29, 2016. Retrieved March 11, 2017. ^ “Alaska Becomes Fourth State To Legalize Recreational Marijuana”. Huffingtonpost. November 5, 2014. Retrieved March 2, 2015. ^ the CNN Wire Staff (November 14, 2010). “Arizona voters approve medical marijuana measure – CNN.com”. Edition.cnn.com. Retrieved February 4, 2014. ^ “Ariz. voters approve medical marijuana – TODAY News”. TODAY.com. November 13, 2010. Retrieved February 4, 2014. ^ “Arizona Becomes Fifteenth State To Legalize Limited Medical Use Of Marijuana”. Norml.org. November 18, 2010. Retrieved February 4, 2014. ^ “Arkansas Election Results 2016”. The New York Times. November 8, 2016. Retrieved November 12, 2016. ^ “NCJRS Abstract – National Criminal Justice Reference Service”. Ncjrs.gov. Retrieved February 4, 2014. ^ Scheinkman, Andrei; Sledge, Matt (November 7, 2012). “Marijuana Legalization On The Ballot”. Huffington Post. Retrieved November 7, 2012. ^ “Colorado Laws & Penalties – NORML.org – Working to Reform Marijuana Laws”. NORML.org. Retrieved November 12, 2016. ^ “Colorado Legalization – NORML.org – Working to Reform Marijuana Laws”. NORML.org. December 10, 2012. Retrieved November 12, 2016. ^ James Orlando, Associate Analyst (December 22, 2011). “Marijuana Penalties”. Cga.ct.gov. Retrieved November 12, 2016. ^ “Delaware Gov. signs bill to allow marijuana for terminally ill”. WKYC.com. August 31, 2016. Retrieved November 12, 2016. ^ “Measure would expand medical marijuana to terminally ill patients”. Delaware State News. May 19, 2016. Retrieved November 12, 2016. ^ “Florida Election Results 2016”. The New York Times. November 8, 2016. Retrieved November 12, 2016. ^ “Atlanta Joins List Of Cities That Decriminalized Marijuana”. October 3, 2017. Retrieved September 13, 2018. ^ Laura Thompson, The Atlanta Journal-Constitution. “High hopes for Clarkston’s marijuana ordinance”. ajc. Retrieved 2019-01-29. ^ Ervin, Camile. “Forest Park Becomes 6th Georgia City To Decriminalize Marijuana”. www.gpbnews.org. Retrieved 2019-01-29. ^ Arielle Kass, The Atlanta Journal-Constitution. “City of South Fulton decriminalizes marijuana possession”. ajc. Retrieved 2019-01-29. ^ Szilagyi, Jessica (2018-12-04). “Statesboro Council Makes Marijuana Possession Non-Arrestable Offense, Says “It’s Not Decriminalization““. AllOnGeorgia. Retrieved 2019-01-29. ^ Arielle Kass, The Atlanta Journal-Constitution. “Fulton County decriminalizes marijuana in unincorporated area”. ajc. Retrieved 2019-01-29. ^ “2010 Georgia Code :: TITLE 16 – CRIMES AND OFFENSES :: CHAPTER 13 – CONTROLLED SUBSTANCES :: ARTICLE 1 – GENERAL PROVISIONS :: § 16-13-2 – Conditional discharge for possession of controlled substances as first offense and certain nonviolent property crimes; dismissal of charges; restitution to victims”. Justia Law. Retrieved 2019-01-29. ^ “2010 Georgia Code :: TITLE 16 – CRIMES AND OFFENSES :: CHAPTER 13 – CONTROLLED SUBSTANCES :: ARTICLE 2 – REGULATION OF CONTROLLED SUBSTANCES :: § 16-13-30 – Purchase, possession, manufacture, distribution, or sale of controlled substances or marijuana; penalties”. Justia Law. Retrieved 2019-01-29. ^ “Medical marijuana is now legal in Georgia”. April 16, 2015. Retrieved April 16, 2015. ^ “Hawaii Becomes First State to Approve Medical Marijuana Bill – New York Times”. HAWAII: Nytimes.com. June 15, 2000. Retrieved February 4, 2014. ^ “Governor Signs Hawaii’s Medical Marijuana Bill Into Law”. Norml.org. June 15, 2000. Retrieved February 4, 2014. ^ “Hawaii Governor Signs Bill Legalizing Medical Marijuana Dispensaries”. The Daily Chronic. ^ “Hawaii Governor Signs Medical Marijana Expansion Law”. Thedailychronic.net. July 14, 2016. Retrieved November 9, 2016. ^ “Idaho Laws & Penalties”. Norml.org. Retrieved March 2, 2015. ^ “Gov. Quinn Signs Illinois Medical Marijuana Bill”. ^ “Referendum Election Results, Questions 1-3 – November 2, 1999 (Secretary of State, State of Maine, U.S.A.)”. Maine.gov. November 2, 1999. Retrieved February 4, 2014. ^ “Maine: Lawmakers Expand Marijuana Decriminalization Law”. Norml.org. May 7, 2009. Retrieved February 4, 2014. ^ “PUBLIC Law, Chapter 67, An Act To Streamline and Clarify Laws Pertaining to the Civil and Criminal Possession of Marijuana”. Mainelegislature.org. Retrieved February 4, 2014. ^ “Maine recreational marijuana vote: Narrow victory for Question 1 gives New England two legalized states”. The Cannabist. November 9, 2016. Retrieved November 9, 2016. ^ “Md. governor signs marijuana bills into law”. WUSA9.com. April 14, 2014. Retrieved November 12, 2016. ^ – “Maryland HB 881” (PDF). Mgaleg.maryland.gov. ^ Abel, David (November 5, 2008). “Voters approve marijuana law change – The Boston Globe”. Boston.com. Retrieved September 8, 2014. ^ “DEMOCRAT Office Name” (PDF). Retrieved February 4, 2014. ^ Rapoza, Kenneth (January 22, 2014). “On Marijuana, Massachusetts Voters Say ‘Legalize It‘“. Forbes. Retrieved February 4, 2014. ^ “Mass. voters say ‘yes’ to legalizing marijuana”. The Boston Globe]. November 8, 2016. Retrieved November 12, 2016. ^ “Marijuana Legalization Minnesota 2015: 5 Things To Know About Opening Of State’s First Medical Pot Dispensary”. June 29, 2015. ^ “Montana Laws & Penalties”. Norml.org. Retrieved March 2, 2015. ^ “Nebraska”. Marijuana Policy Project. July 6, 2012. Retrieved November 9, 2012. ^ “Nevada Medical Marijuana Dispensaries and Authorized Users Still Face Potential Criminal Penalties « Las Vegas Criminal Defense Blog”. Legalmann.wordpress.com. Retrieved February 4, 2014. ^ “Nevada Medical Marijuana Act, Question 9 (2000)”. Ballotpedia. Retrieved February 4, 2014. ^ “Nevada Question 2 — Legalize Marijuana — Results: Approved – Election Results 2016”. The New York Times. November 8, 2016. Retrieved November 12, 2016. ^ “Nevada – MPP”. Marijuana Policy Project. January 22, 2018. Retrieved January 22, 2018. ^ “Governor Hassan’s Statement on Signing HB 573”. Governor.nh.gov. July 23, 2013. Retrieved February 4, 2014. ^ “N.H. becomes 19th state to legalize medical marijuana as Hassan signs bipartisan bill”. Concord Monitor. Retrieved February 4, 2014. ^ “Signed by the Governor: New Hampshire Broadens Medical Marijuana Law, Further Nullifies Federal Prohibition”. Tenth Amendment Center Blog. ^ “ASSEMBLY COMMITTEE SUBSTITUTE FOR ASSEMBLY, No. 804 : STATE OF NEW JERSEY : 213th LEGISLATURE” (PDF). Njleg.state.nj.us. Retrieved November 12, 2016. ^ “Medical marijuana use legalized in N.J.” Bizjournals.com. Retrieved November 12, 2016. ^ “Signed into Law: New Jersey Bill Expands Medical Marijuana Program Despite Federal Prohibition”. Blog.tenthamendmentcenter.com. September 19, 2016. Retrieved November 9, 2016. ^ “Join the Marijuana Policy Project”. Marijuana Policy Project. Retrieved 2018-04-16. ^ “New Mexico Becomes Twelfth State To Authorize Medical Cannabis Use”. Norml.org. Retrieved February 4, 2014. ^ “Richardson to legalize medical marijuana”. NBC News. Associated Press. March 16, 2007. Retrieved February 4, 2014. ^ “New York Laws & Penalties”. Norml.org. Retrieved March 2, 2015. ^ “New York Becomes 23rd State To Allow Medical Marijuana « CBS New York”. Newyork.cbslocal.com. July 7, 2014. Retrieved March 2, 2015. ^ “NY becomes 23rd state to allow medical marijuana | New York Post”. Nypost.com. Associated Press. July 7, 2014. Retrieved March 2, 2015. ^ “North Dakota Election Results 2016”. Retrieved November 9, 2016. ^ Kruse, Michael (November 17, 2015). “Kasich legalizes medical marijuana in Ohio”. Politico.com. Retrieved November 12, 2016. ^ “Gov. Mary Fallin signs bill allowing pilot program for cannabis oil”. Koco.com. April 30, 2015. Retrieved July 6, 2015. ^ “Voters legalize recreational pot in Oregon”. KGW Portland. November 4, 2014. Retrieved November 5, 2014. ^ “Oregon Legalized Marijuana Initiative, Measure 91 (2014)”. Ballotpedia. Retrieved November 5, 2014. ^ “Oregon Governor Signs Marijuana Legalization; Sentencing Reform Law”. The Daily Chronic. ^ “Nullification in Effect: Oregon Governor Signs Law to Further Implement Marijuana Legalization”. Tenth Amendment Center Blog. ^ Marcus McCoy (July 28, 2015). “Oregon Governor Signs Bill Allowing Pot Sales Oct. 1”. Nbcrightnow.com. ^ Ashley Stewart. “Oregon Governor Signs Marijuana Sales Tax”. Nwnewsnetwork.org. ^ “Pennsylvania Laws & Penalties”. Norml.org. Retrieved February 4, 2014. ^ McKinney, Mike (June 13, 2012). “R.I. Gov. Chafee signs into law decriminalization of small amounts of marijuana / Poll | Breaking News | providencejournal.com | The Providence Journal”. News.providencejournal.com. Retrieved June 23, 2013. ^ “South Carolina Laws & Penalties – NORML.org – Working to Reform Marijuana Laws”. Norml.org. Retrieved July 5, 2016. ^ “South Carolina Medical Marijuana Bill Signed by Gov. Nikki Haley”. Thedailychronic.net. Retrieved October 31, 2016. ^ “South Dakota Laws & Penalties”. Norml.org. Retrieved March 2, 2015. ^ “Gov. Bill Haslam signs cannabis oil bill”. The Tennessean. May 4, 2015. ^ “Texas”. Mpp.org. December 15, 2014. Retrieved March 2, 2015. ^ “Abbott Legalizes Cannabis Oil for Epilepsy Patients”. Texastribune.org. June 1, 2015. Retrieved June 10, 2015. ^ “11 States with Pending Legislation to Legalize Medical Marijuana – Medical Marijuana – ProCon.org”. Medicalmarijuana.procon.org. February 19, 2015. Retrieved March 2, 2015. ^ Lockhart, Ben (March 21, 2018). “Utah governor signs bill allowing medical marijuana use by terminally ill patients”. Deseret News. Retrieved April 18, 2018. ^ “Utah Laws & Penalties – NORML.org – Working to Reform Marijuana Laws”. NORML.org. Retrieved November 12, 2016. ^ “Vermont Approves Amended Medical Marijuana Measure”. Norml.org. May 20, 2004. Retrieved February 4, 2014. ^ “Vermont Expands State Medi-Pot Law – Legislatures In Connecticut, Rhode Island Also Endorse Medical Cannabis”. Norml.org. June 7, 2007. Retrieved February 4, 2014. ^ “Gov. Shumlin signs bill decriminalizing possession of limited amounts of marijuana | The Official Website of the Governor of Vermont”. Governor.vermont.gov. June 6, 2013. Archived from the original on June 10, 2013. Retrieved February 4, 2014. ^ Zezima, Katie (2018-01-24). “Vermont is the first state to legalize marijuana through legislature”. Washington Post. ISSN 0190-8286. Retrieved 2018-01-31. ^ “§ 18.2-251. Persons charged with first offense may be placed on probation; conditions; substance abuse screening, assessment treatment and education programs or services; drug tests; costs and fees; violations; discharge”. law.lis.virginia.gov. Retrieved 2018-06-26. ^ “§ 18.2-250.1. Possession of marijuana unlawful”. law.lis.virginia.gov. Retrieved 2018-06-26. ^ “I-502 Implementation”. The state of Washington: Washington State Liquor Control Board. 2013. ^ a b “2016 States with Legislation or Ballot Measures to Legalize Medical Marijuana – Medical Marijuana – ProCon.org”. Medicalmarijuana.procon.org. Retrieved November 12, 2016. ^ “Wisconsin Laws & Penalties – NORML.org – Working to Reform Marijuana Laws”. norml.org. Retrieved July 5, 2016. ^ “Wyoming Laws & Penalties – NORML.org – Working to Reform Marijuana Laws”. NORML.org. Retrieved November 12, 2016. ^ “Washington DC legalises marijuana possession and use”. BBC News. February 26, 2015. Retrieved February 26, 2015. ^ “DC, Oregon, and Alaska Just Voted to Legalize Marijuana”. Mother Jones. ^ National Drug Intelligence Center, US Department of Justice (June 2001). “American Samoa Drug Threat Assessment”. Product No. 2001-S0388AS-001. ^ “Guam Legalizes Medical Marijuana”. Huffington Post. November 4, 2014. ^ Project, Marijuana Policy. “Northern Mariana Islands HB No. 20-178 – MPP”. MPP. Retrieved 2018-09-21. ^ Sifferlin, Alexandra (May 4, 2015). “Puerto Rico Governor Signs Executive Order to Legalize Medical Marijuana”. Time. ^ Armentano, Paul (December 22, 2014). “Pot Possession Decriminalized In US Virgin Islands”. NORML. Retrieved January 18, 2019. ^ a b “Tribe Bets on Legal Pot”. US News. June 16, 2015. Archived from the original on August 1, 2015. Retrieved July 12, 2015. ^ “Deal to let Suquamish Tribe open Kitsap County pot store”. September 14, 2015.